McDonald's Durian McFlurry? I'm Loving It! I am back with another McDonald's post! Hahaha... I bet you are thinking did I get endorsed by McDonald's or something...well bummer! I could only wish I was the ambassador of one of my favourite food brands. After the McDonald's Spicy Korean Burger hype comes in another hype that locals can only rave non-stop about...the McDonald's Durian McFlurry! Wooohooo...go durian! Okay, some of you might hate the taste or smell of durian but for me and my family (and most of my friends) we, practically, 'worship' this fruit. The one-of-a-kind mushy sweet scent and rich creamy texture of the durian is truly an instant winner! 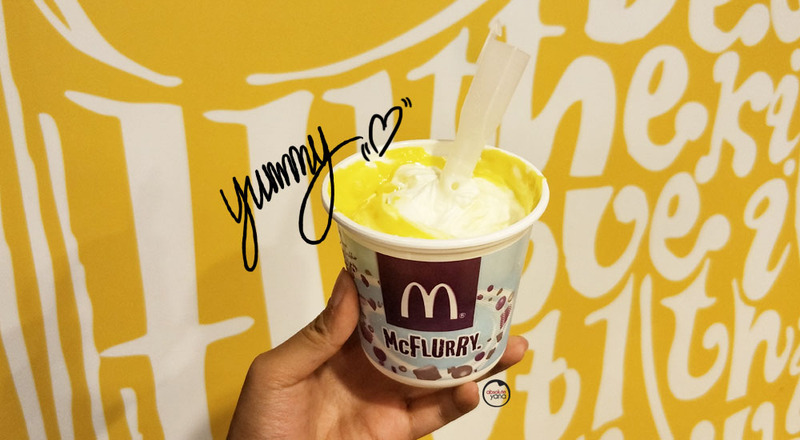 So, when McD announced the Durian-flavoured McFlurry, Malaysians went gugugaga over it. Every outlet had long stretches of cars piling up and for those who had a streak of bad luck kept facing the "Sold Out" signages. And thankfully, I am one of the lucky ones who got to taste the King before it was completely sold out nationwide. How crazy is that? I am actually surprised that though there are people who hate the sight and scent of the durian, it didn't deter them away from grabbing a bite of other meals. So, personally, I do fancy the Durian McFlurry for its taste and the little chunks of the fruit itself. But! I did wish that they did not mark up the price of the McFlurry - RM7.99 for a cup of ice cream durian is a little overpriced in my opinion. If they were putting in more chunks of the durian then yea...RM7.99 is completely worth it! Actually, I am kind of on the fence for the price as I do know that we are talking about durian; it's like one of 'high end' fruits in Malaysia. What do you think of the whole hype? And do let me know in the comment box below if you were able to taste this McFlurry before it "Sold Out" or you rather not just to save your nose? I'm really love this Durian Mcflurry. I love the taste similar like the real fruit.